Saturday the crew met at the boat. The race started at 10:30 am. The winds were blowing at around 3 kts at the start, building to probably 14 kts before the end. This race has historically been known for postponed starts due to lack of wind. This year was different. The wind was light, but it existed! We somehow made a perfect start, walking the line from the committee boat. We managed to keep our boat moving and accelerated away from the other boats in our fleet. We tried not to let Wet Express get away from us. We had no worries as it turned out, they sailed the wrong course. We tacked to the right side of the course. I remember Karl always said, “if the winds are light, go right”. Thanks Karl! Our Canadian built CS 36 was soon going to weather at 6.6 kts with our new Mylar/Pentex Banks 155 genoa. The rest of our fleet stayed to the left. When we neared the shoreline, we tacked and the speedometer went to 6.8 with apparent wind gusting to 19 kts. We made 3 more tacks to the lay line and suddenly realized that there were no boats in front of us. We crossed the finish line, motored into the yacht basin inside the breakwater at NASCC and dropped anchor. The only boats there were the few that had just motored over for the party. What happened!?! This has never happened to us before. We got out our toys and got the party started. Now this is the part I love…the party! We got out the food and the swim toys and the Bahama Mammas and the Blue Hawaiian drinks in coconut shell cups with flamingo straws. We put on our leis and our hula skirts. We floated and relived the hi-lights of the race. It was at this time that one of the crew members of the Wet Express came over to question us about the course. It seems that they had failed to see the second course board labeled 150 Class showing our course to be “Start, Finish”. Wet Express had sailed the all sails course, which had a downwind leg. Thank you Wet Express! That’s sailing!!! The party on Saturday night was at the Bay Club on base. They served the usual fare, a Hawaiian dinner with roast pig and lumpias. The wine and beer flowed. This year the entertainment was Larry Joe Taylor. It was nice to be familiar with the music as it seems we find LJT everywhere these days. Our crew was excited but too afraid to jinks things by hoping out loud that we might place this year. When they called our name for first place 150 A Class, our crew gave a great whoop! 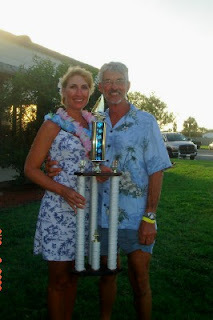 Bruce and I went up to claim our trophy, the first we’ve ever received on Elan and it was won with full water tanks! It was a wonderful day!